Lady Gaga. Rachael Ray. Barack Obama. They've all mastered the fame formula, so called by authors Maggie and Jay Jessup. 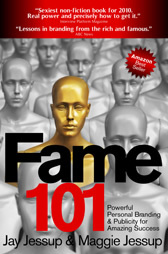 The publicists and founders of Platform Strategy have written a book called Fame 101 about what it takes to get famous fast -- and no, going viral on YouTube isn't really part of the plan. Here, Ms. Jessup shares some of her thoughts on brand building, the "two kinds" of fame, and why simply networking doesn't work. 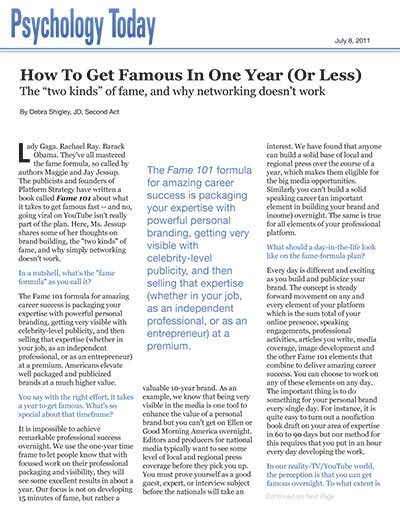 In a nutshell, what's the "fame formula" as you call it? The Fame 101 formula for amazing career success is packaging your expertise with powerful personal branding, getting very visible with celebrity-level publicity, and then selling that expertise (whether in your job, as an independent professional, or as an entrepreneur) at a premium.  Americans elevate well packaged and publicized brands at a much higher value. You say with the right effort, it takes a year to get famous. What's so special about that timeframe? It is impossible to achieve remarkable professional success overnight. We use the one-year time frame to let people know that with focused work on their professional packaging and visibility, they will see some excellent results in about a year. Our focus is not on developing 15 minutes of fame, but rather a valuable 10-year brand. As an example, we know that being very visible in the media is one tool to enhance the value of a personal brand but you can't get on Ellen or Good Morning America overnight. Editors and producers for national media typically want to see some level of local and regional press coverage before they pick you up. You must prove yourself as a good guest, expert, or interview subject before the nationals will take an interest. We have found that anyone can build a solid base of local and regional press over the course of a year, which makes them eligible for the big media opportunities. Similarly you can't build a solid speaking career (an important element in building your brand and income) overnight. The same is true for all elements of your professional platform. What should a day-in-the-life look like on the fame-formula plan? Every day is different and exciting as you build and publicize your brand. The concept is steady forward movement on any and every element of your platform which is the sum total of your online presence, speaking engagements, professional activities, articles you write, media coverage, image development and the other Fame 101 elements that combine to deliver amazing career success. You can choose to work on any of these elements on any day. The important thing is to do something for your personal brand every single day. For instance, it is quite easy to turn out a nonfiction book draft on your area of expertise in 60 to 90 days but our method for this requires that you put in an hour every day developing the work. In our reality-TV/YouTube world, the perception is that you can get famous overnight. To what extent is that true? There are two kinds of fame: the Paris Hilton and Kim Kardashian type where someone becomes known for "being known" rather than for any contribution to society; in contrast, the type of fame we evangelize is based on professional success whether as a scientist, startup guru, or professional in any field. The reality TV sort of fame focuses on "15 minutes of fame" whereas professional branding builds a lifetime career. The model we use at our firm to help people package their expertise, get very visible, and monetize the results is of the second sort. It's not trivial. It takes hard work and delivers life-changing results in terms of income and other measures of success. It is the key to joining the elite of your field. In your book, you write about public figures that get to the elite 1 percent of their professions. What do those folks seem to have in common? Our research of 75 successful American icons ranging from Rachael Ray to Barrack Obama helped us identify the common traits of the most successful 1 percent of our society. In essence, every field has its alpha celebrities whether teachers (think Michelle Rhee), attorneys (think Gerry Spence), politicians (Sarah Palin), financial gurus (Suze Orman), or even America's best-known gardener. We found that all are as adept at publicity as any Hollywood celebrity and all have an intuitive understanding of packaging what they do into a unique personal brand. We are absolutely in favor of building a network and it is a phenomenally valuable element of career success but "networking" has come to mean something else, something negative in our professional lives. It is easy to identify the distinction. When you meet someone who is "networking," too often their attitude is one of "What can you do for me?" as they race through Chamber of Commerce or industry events collecting business cards and building their LinkedIn network with every person they meet--whether or not that person has any possible professional connection. By this I mean do you really need to have the manager of the company that made T-shirts for your charity event in your professional network? I believe that building relationships over time with 20 or 50 or 100 people with a "How can I help you?" attitude creates a powerful network that is more valuable than one based on one-time meetings and follow-up calls on an Outlook schedule.